JFK Lawn & Landscape offers thorough gutter cleaning services for residential and commercial properties. We are currently in the heart of the summer season. Before you plan your last couple of beach trips, pick up the phone and schedule a time for your gutters professionally cleaned. Having your gutters cleaned is critical for the protection and maintenance of your property. Also, it helps to protect the foundation of your property. Insufficient water drainage can lead to an unsafe walkway and a leaky basement. 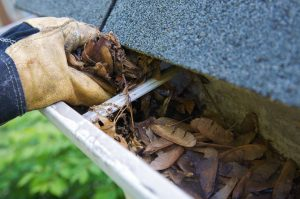 Keep reading and discover more reasons you should have your gutters cleaned before summer’s end! In addition to preventing structural damage to your home, you want to have your gutters cleaned to stop the growth of mold. When a gutter system is clean and fully functioning, it should direct water away from your home. If water gets behind walls, mold can form because it is in a warm climate. You especially want to prevent “black mold” which cause all sorts of respiratory and immune system issues for a person. Bugs love living in clogged gutters. Not only is it warm, but it is a protected spot that is away from many predators. If you want to prevent unwanted bugs such as carpenter ants and termites from inhabiting your gutters, they need to be cleaned periodically throughout the year. Since your gutters often take a beating during the summer months from hot weather and summer storms, you want to closely monitor them this time of the year. Summer thunderstorms shake leaves, sticks, and other forms of debris from trees, which will accumulate in your gutters. By keeping your gutters clean, you are preventing a lot of weight from collecting in and around them. Many homeowners assume that just because the rain season is over, you no longer need to pay attention to the cleanliness of your gutters. You can get yourself in a lot of trouble for thinking this way because clogged gutters can sometimes cause basements to flood. A great way to prepare for the fall season is to have your gutters professionally cleaned. When leaves begin falling from trees, you will have peace of mind that your gutters can handle the additional weight and volume. Gutter cleaning can help prevent thousands of dollars in damages to your property. We offer thorough gutter cleaning services for residential and commercial properties. The JFK Lawn & Landscape gutter cleaning package includes debris removal from roofs, gutters, and downspouts. Contact us today! This entry was posted on Wednesday, August 1st, 2018 at 4:19 pm. Both comments and pings are currently closed.